I ended up my previous Chronicle with a call to myself—I should say something about the Pilot Custom 823. This is a pen I have avoided on these text as it is well known and many people have reviewed it in detail. One more review on my side would hardly offer anything new. However, the release of the Pilot Custom Urushi has reframed the pen scene –if only, for Pilot— and the Custom 823 might have become even more interesting now. That is the contention of this piece. 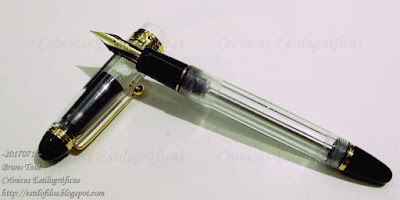 The Pilot Custom 823 was launched in the year 2000, or year 82 of the Pilot era. A story published on a French forum affirmed that this model was the Pilot reaction to the Pelikan M800, a pen many aficionados consider as a compendium of virtues. I have not been able to confirm that story, but its narration is worth of Ben Trovato. 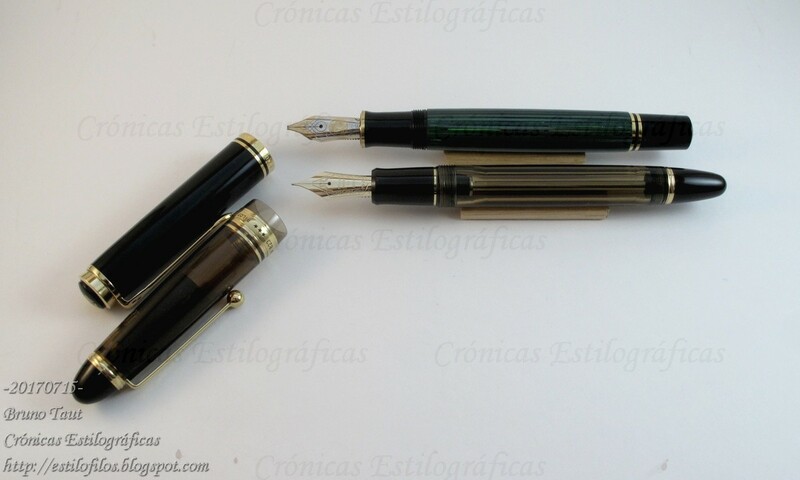 Pelikan M800 and Pilot Custom 823. In any event, the M800 and the Custom 823 are very different. The sizes of their nibs are almost the same, but that might be the end of the similarities. The Custom 823, in fact, follows the tradition of the Onoto pens arriving in Japan at the turn of the 20th century. The plunger filler is, in that regard, a lot less alien to Japan than the very German piston of Pelikan. Of course, there are examples of pistons made in Japan, most notably by Vanco in the 1930s. The big three companies have all made some pistons, but all those examples are rather new: Platinum in 1989, Sailor in 2006, Pilot in 2010. The Custom 823 first appeared in 2000 and included a fully transparent version. Its price was JPY 30000 (plus tax) and has not changed since then. The clear version soon disappeared from the catalog, leaving the amber and smoke models we now know. The clear version reappeared around 2011 at some shops —and can still be found at those—, but it has not yet reached the glory of the catalog. The Custom 823 in its three versions: smoke, amber, and clear (back to front). Nib-wise, the Custom 823 implements size 15 nibs (in Pilot's way of sizing), but out of the 14 available points of this size, only three, according to the catalog, are available on the Custom 823: F, M, and B. Some shops, at least in Tokyo, also offer other nib points, particularly the waverly (WA) and the falcon (FA). In fact, the 823 could take any size 15 nib, and that is what some retailers do by exchanging the nib with any of the options available in the Custom 743 model. Whether those swapping void the warranty offered by Pilot is not clear. A Custom 823 clear with a "falcon" (FA) nib. This combination is not included in the Pilot catalog. It is offered by some shops. This picture was taken at Maruzen-Nihonbashi. Another combination that does not appear on the books: clear Custom 823 with a "waverly" nib. Available at Asahiya-Kami Bungu. The model 823 is now 17 years old and it remains as one of the most interesting models currently made by Pilot. Now, the Custom Urushi might, paradoxically, make it even more interesting. The Custom Urushi is certainly an impressive pen, but it is also expensive (JPY 88000), and the search for alternatives within the Pilot (and Namiki) catalog leads to the smaller Custom 845 (JPY 50000), also decorated with urushi, and to the Custom 823 and Custom 743 (JPY 30000). 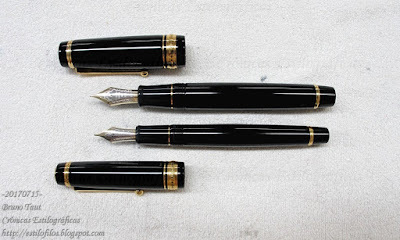 On these three cases, the potential buyer had to settle down with the smaller size 15 nib. My contention, then, is that faced with the obligatory reduction in nib size to lower the actual cost of the pen, the JPY 30000 of the nominal price of the Custom 823 are an even more impressive value given, most interestingly, its self-filling system. The urushi relatives of the Custom 823: Custom Urushi (top) and Custom 845 (bottom). The stark contrast between those JPY 88000 of the Custom Urushi and the JPY 30000 of the 823 makes the later a lot more appealing. A lot more, I think, than when the obvious competitor was the Custom 845 at a value of JPY 50000. You're making a very interesting point by introducing the 823 in your discussion of the Custom Urushi and the Custom 845. I have to agree with you. The 823 is a much more interesting pen both from a value for money and a filling system perspective. 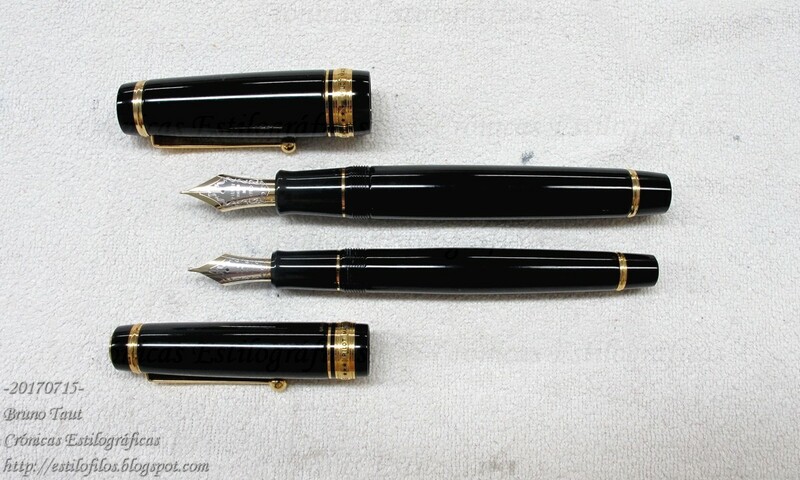 Even though the other two pens have urushi bodies they lack any decoration and are that thus in some way viewed as just "black pens". The 823 holds more ink, has a more interesting filling system, and also is a very functional and aesthetically pleasing demonstrator. In terms of construction quality it is par with the other two. 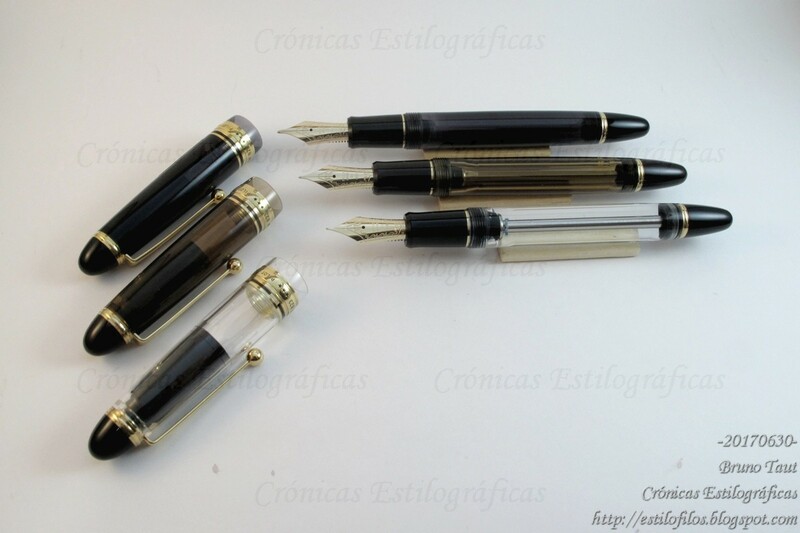 Add the size 15 nib and you have a really great pen for a very good price! Thanks, Nikos, for your comment. I guess I can summarize our points by saying that the decoration is not the essence of the pen. Gracias, Leonardo, por pasar por estas págincas. No sé si Pilot fabrica sacos para sus viejas plumas. En cualquier caso, nada tienen de especial los sacos de las Super de los años 50 y 60. Cualquier saco de la medida adecuada funciona bien. El problema, si acaso, es instalarlo en la pluma dado que el anillo en el que se fijan está bien dentro de la boquilla en muchos de los modelos Super y es necesario extraer el alimentador para instalar el nuevo saco.